Chart of Accounts is a listing of the categories that QuickBooks uses to summarize money movement for your company’s financial statements. If this seems a bit confusing to you, that’s okay—most business owners won't need to modify this. In fact, unless you have a background in accounting or finance, it’s probably best to leave the Chart of Accounts as ­is. However, if you plan to make changes to the Chart of Accounts, you should know that there are five basic types of accounts: income, expenses, assets, liabilities, and equity. Think of each type as a kind of bucket used to catch the various transactions of your business and whose contents in turn flow into your financial statements. Most of the time you won’t need to create any new types of accounts. 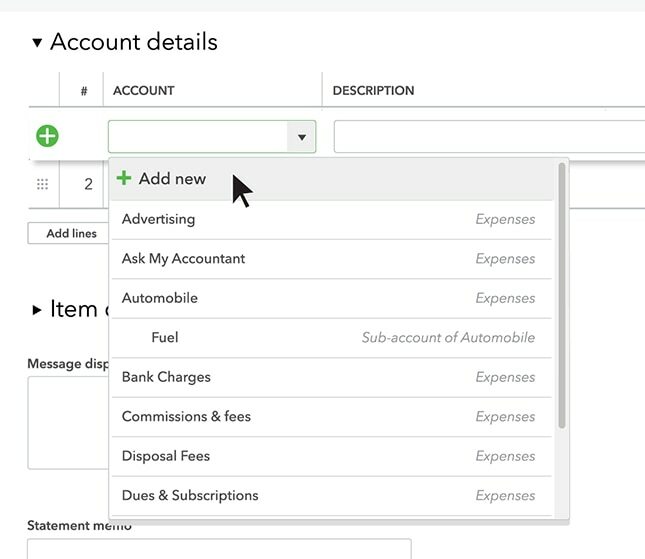 QuickBooks already has these customized accounts for you the first time you log in. However, you may find that you need another account category; you’ll probably want to add it while you’re writing a check, or entering a credit card charge, or recording some other transaction. Here’s how you do it from an expense. From the Home Screen click the + Menu and select Expense to add a new expense. 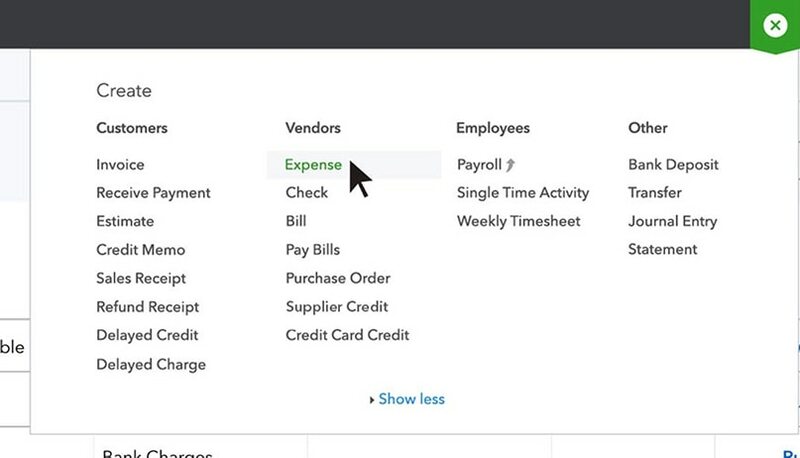 On the Expense Page click on the Choose Payee drop-down menu to select the payee. Enter the Payment date and Payment method for your transaction. Next, you’ll want to give this account a descriptive name so you can quickly find and use it later. 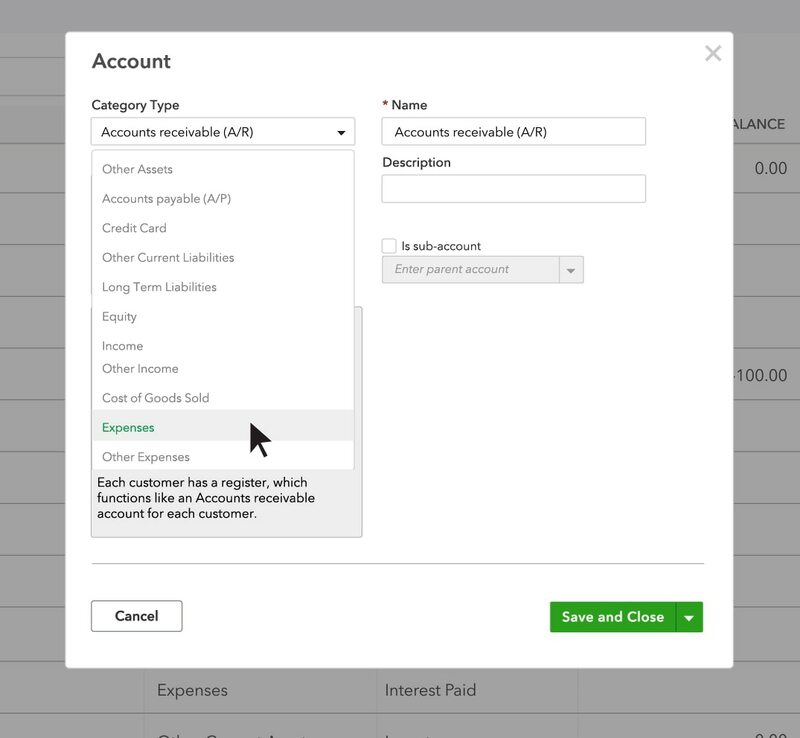 In the Account Details section, beneath the first field labeled “Account” click on the drop-down menu button and choose a name for your account from the drop-down menu. If you don’t see a name you like from the list of existing options, click + Add New at the top of the list. 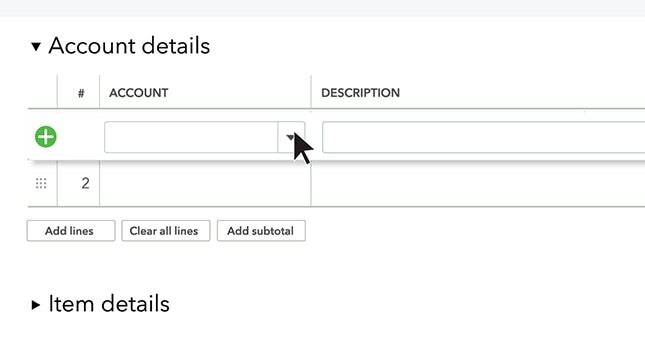 This will open the Account Detail menu where you can create your own custom account name and details. 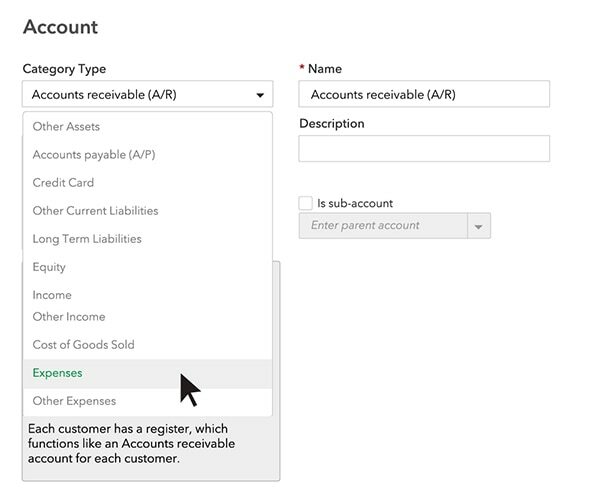 In the Account Detail menu, select a Category Type from the drop-down menu options. Remember that what you choose here determines which financial statement this account will show up on and where it’ll show up—so it’s important that you choose correctly. 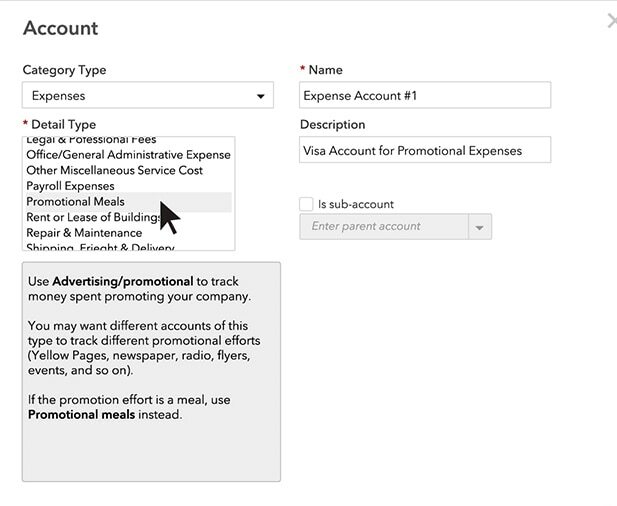 Next, choose a Detail type that best fits the account. Another good account to add is one named “Ask My Accountant.” You can use this account any time you’re not sure which of your accounts to use. To create this account, first navigate to the Chart of Accounts by clicking on Accounting in the left navigation bar. 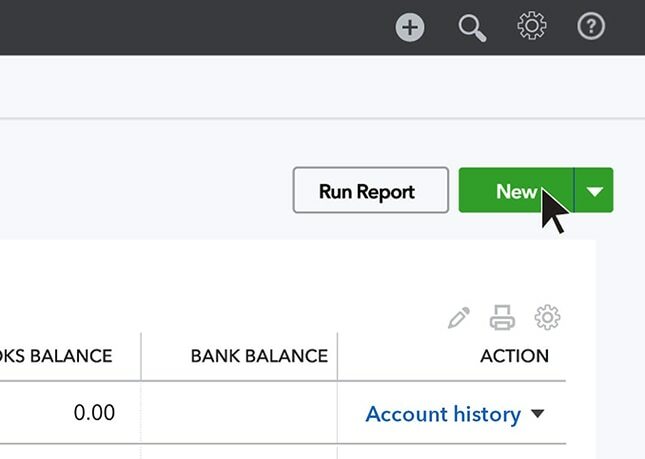 On the Chart of Accounts screen, click the New button to open the Account form menu. Type the name “Ask My Accountant” into the name field on the right and click Save. Once in a while you might need to edit an existing account. 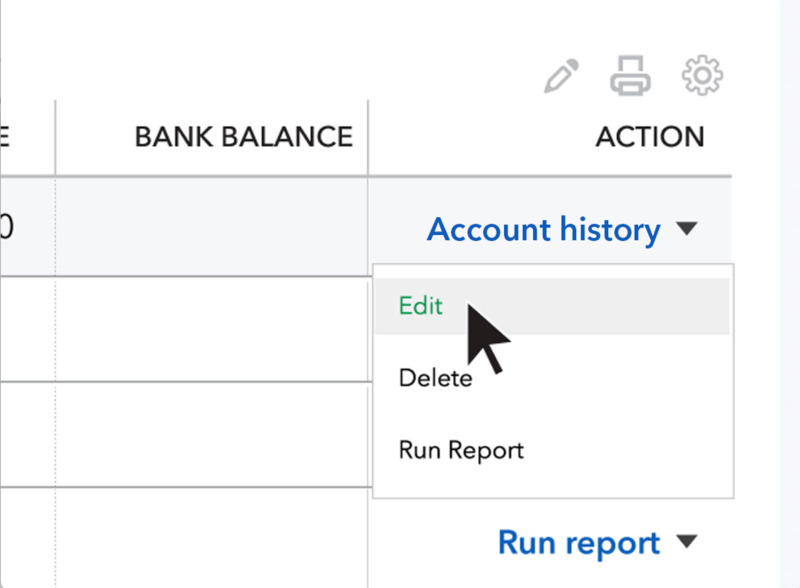 To do this from the Chart of Accounts screen, find the account you want to edit and click the drop-down menu next to the words Account History, then choose Edit to make your changes. If you ever want to delete an existing account from your Chart of Accounts, find the account you want to edit on the Chart of Accounts screen. Click the drop-down menu next to the words Account History, then choose Delete.